The silvery spires of Canary Wharf, the spotless thoroughfares and perfectly kept squares, sit upon the buried foundations of the West India Import Dock. From its early days when the Isle of Dogs (as it is also, poetically, known) was the beating heart of an expanding trading empire, to the Night of Fire when the German Luftwaffe turned the dock and great swathes of Wapping into a fiery furnace, this area of London has never seen a particularly pretty day. Today the Wharf is pacified and gentrified and is now this country’s financial powerhouse, with not one jot of its former guise to be found anywhere. That is except for “The Hibbert Gate”, a recreation of the original entrance to the West India Dock and one of the many pieces of public art which can be found dotted throughout the Wharf, randomly scattered, around its sculpted parks and ramrod straight streets, art often missed by eyes consistently drawn skyward by the impressive high-rise scene. Canary Wharf reeks of New York, but without the irrepressible intensity, it is strangely impotent of atmosphere, its atmosphere being only its distinct and obvious lack of one. The art adds something though, a little bit of post modern mystery in a place which has had its real genetic make-up erased and forgotten. 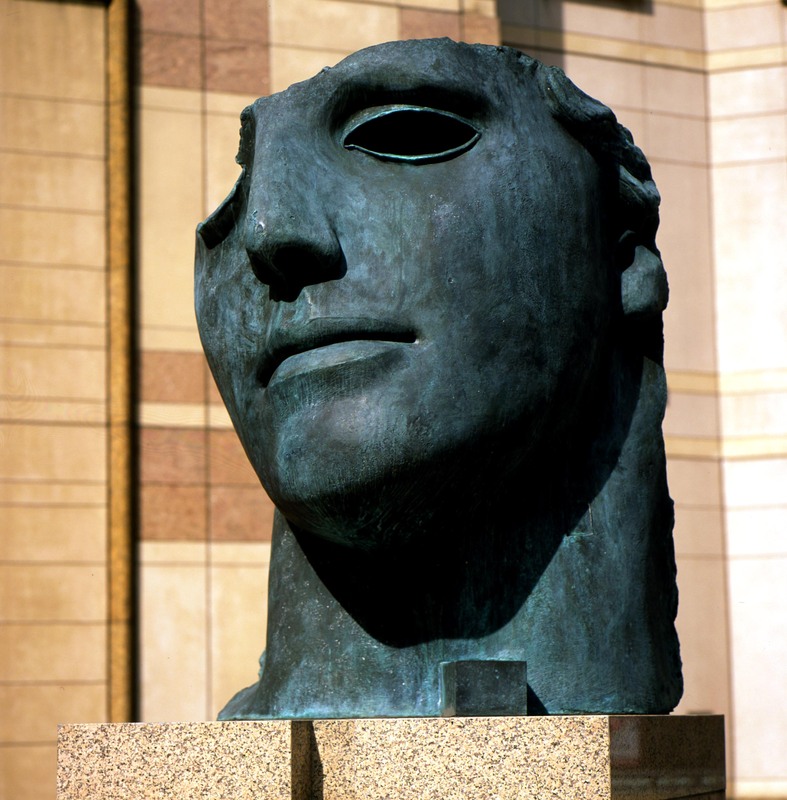 Outside Jubilee Place lies “Testa Addormentata”, a large bandaged bronze head, Grecian in style, with a proud but losing face, created by Polish artist Igor Mitoraj. Though impressive, it seems awfully small in comparison with its surroundings, like a topped and tailed colossus from antiquity, lacking its trunk to lend it stature. It probably felt bigger in the workshop, but now it lays cheek side down, gazing towards the glitzy giant of 1 Canada Square. Antiquity bettered. 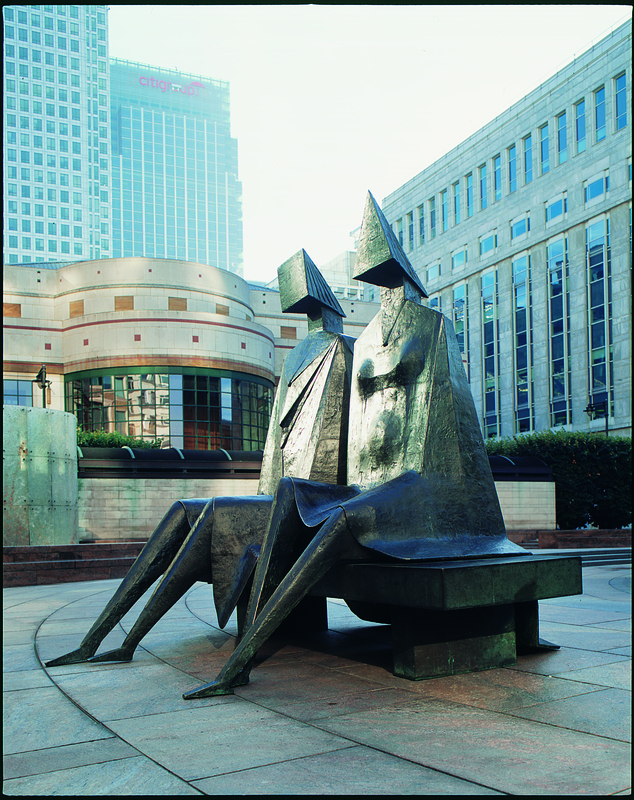 In Cabot Square sits Lyn Chadwick’s bronze “Couple on a Seat”, two figures, sat aloof from the bustling square, the king and queen of Canary Wharf gazing out towards the docks. Though not particularly regal, instead pointy and frigid and cold, they are not without grace, the gentle angles at which their legs lie and the drift of their clothes being particularly effecting. Nobody seems much to notice them though, theirs is a subdued monarchy, their rule is constant, yet forgotten. A much more light-hearted, just as tragic figure, can be found to the right of Cabot Square on West India Avenue, a big man holding out for hugs, a rough hewn bronze figure, Giles Penny’s “Man with Arms Open.” To be taken seriously around this part of town you have to be metallic to the core, no icon of the Wharf could be anything but, yet this man’s arms are stretched backwards, in anticipation of affection. It’s such a desperately sad moment to be stuck at, near an embrace, but not quite there, the ruffles in the bronze metal work lending a crumpled look, helping to create a rather hopeless aura around him. But where is the lady who has escaped our man’s wasted embrace? She is probably waiting beneath Konstantin Grcic’s “Six Public Clocks” for another metallic friend.The work comprises of six metal clock faces, based upon that icon of punctuality, the Swiss railway clock, the faces all sitting in Nash Court, atop six metallic lollypop sticks. It is such an excellent place to meet, in a town which runs to deadline and schedule. J.D. Salinger said “If a girl looks swell when she meets you, who gives a damn if she’s late? Nobody.” But stood under the clocks it would be obvious, six fold obvious, that someone was late, and the aggrieved party could stand there with a knowing smile, glance upwards, brush off those lost minutes and rush into a grateful greeting. Embrace returned. How ironic it would be though if the clocks were all stopped? Timelessness brought to a place which sim ply could not stand it. In nearby Columbus Courtyard there is another Mitoraj head, “Centurione I”, a mask really, half smashed and missing a piece, this one is much more ominous looking, much more desperate, fed by a slide of water which appears to sustain it. It is quite amazing that someone can craft such a haunting face when the remaining eye is empty, but its shape alone screeches emotion. The courtyard is almost empty and the only thing which will stop lingering passers-by from imagining themselves as lost wanderers through an empty unrecognizable future city who have just ran across a mask-like fragment of a lost civilisation they used to know, is the empty Pret a Manger to the left of the sculpture, which keeps your imagination very much tied to earth. At Westferry Circus the river can finally be seen again and all the sights of Central London upstream are welcome reminders that you haven’t left the city after all. The Circus is prim and un-British in its perfection and amid a flowerbed can be found a golden egg, a sasso cosmico, a cosmic stone. 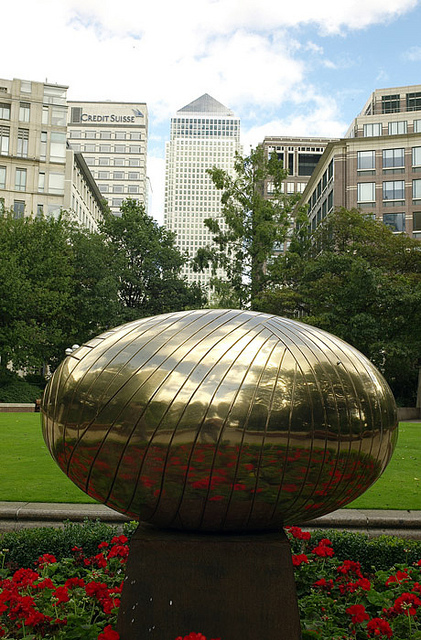 The Golden Egg of Canary Wharf, a sculpture by Do Vassilakis-König, a golden trinket not born out of the stock market or a dot com boom, but washed up from the Thames, perhaps, a mysterious link between the new and the original, the city and the river, because whatever outfit the Wharf wears, the river will always surround it.